SML launched its second RFID Technology and Innovation Center in Clayton, North Carolina, allowing prospective item-level RFID customers to try out the technology in a realistic setting. SML Group, the global supply chain and retail solutions provider, hosted a multi-day event on May 12-14 to commemorate the grand opening of its RFID Technology & Innovation Center in Clayton, North Carolina. The center showcases cutting edge RFID technology, including tags, item-level RFID software, and hardware configurations, allowing partners, customers and SML Group employees to get hands on experience with RFID in real-world environments. This facility was constructed in response to the growth in demand by SML's customers for item-level tags. SML saw high double-digit growth in revenue from sales relating to its RFID solutions business, and expects continued strong growth due to increased RFID deployments in the retail sector. In addition to tag technology and manufacturing capacity, the Center features Xterprise’s Clarity™ suite of item-level applications, which span both supply chain and in-store business cases. Full systems are in place so that customers can touch and feel the technology in warehouse, backstock, and sales floor environments, providing a view of how the technology can create business value for both brand owners and retailers. The Clayton center is SML’s second opening in six months, the first being at Corby, UK last December. 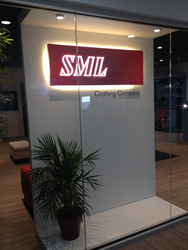 In addition to the Corby and Clayton locations, SML plans to open an additional RFID Technology and Innovation Center in Spring 2015 at SML World Headquarters in Hong Kong. About SML: SML is a global total brand identification solutions provider serving an international clientele consisting of top fashion brands and some of the largest retailers in the world. Its wide range of high quality products includes woven labels, printed fabric labels, EAS, RFID, heat transfer, packaging, specialty trims, printed paper products, etc. With presence in over 30 countries and wholly-owned manufacturing facilities around the world, it is committed to effectively and efficiently serving the worldwide needs of clients and exceeding their expectations in quality, price, service and speed. The SML ViziT™ brand provides for RFID item visibility with EAS-type loss prevention and includes RFID-enabled labels/tickets/hangtags, as well as EPC serial-number chip encoding which is provided through a network of globally located service bureaus. A cloud-based IT data management solution completes the ViziT™ package. Visit the SML website at http://www.sml.com. About Xterprise LLC (a member of the SML Group): Xterprise was founded in 2002 and was acquired by SML Group in 2013. The company offers item-level RFID solutions with a focus on brand owners and retailers. Built on top of the Clarity™ application platform, Xterprise applications have been deployed in big box retailers, specialty retailers and brand owners across hundreds of sites, utilizing thousands of RFID readers and managing hundreds of millions of RFID mission critical inventory transactions every month around the world. Xterprise is based out of Carrollton, TX. The company can be reached via its website at http://www.xterprise.com or by email at info(at)xterprise(dot)com.